Inspired by Rita Hayworth’s characters in 1940’s and 50’s films, Robert Vasquez, like his mentor and hair stylist superstar Garren, often reinvents the Vintage Hollywood Glam style. Vasquez demonstrated the parting and curl direction that recreates this look and featured R+Co products that bring the curls to life with volume and long-lasting hold. Dallas Thickening Spray volumizes hair, holds heat-styled looks, and prevents moisture loss; Grid Structural Hold Setting Spray blocks humidity and holds shape so the style lasts longer; Foil Frizz + Static Control Spray tames flyaways and frizz while adding shine, eliminating static, adding shine and providing heat protection; Outer Space Flexible Hair Spray’s memory allows the stylist to brush through a set style, knowing it will go back into place. Soft, romantic and tousled looks continue into 2018, as brides are opting for loose romantic looks that capture the casual elegance of today’s formal trends. Alley Biehl’s styling class demonstrated foundational styling skills in creating the ultra feminine bride. Soft curls and whimsical braids update the classic up-do, creating the 2018 “Textured Up-do.” Side-swept, half-up-dos feature a twist or braid alongside cascading curls that for the look of a bridal goddess. 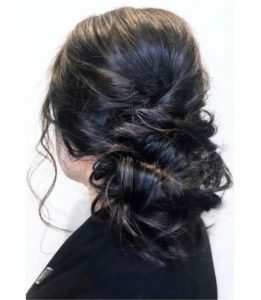 Wispy tendrils compliment 2018’s version of a chignon bun, it’s luxurious yet relaxed. Members of Samuel Cole Salon’s Education Team, stylists Katie and Libby are instrumental in teaching several cutting, coloring and styling classes to Associates who go through our Immersion Program. 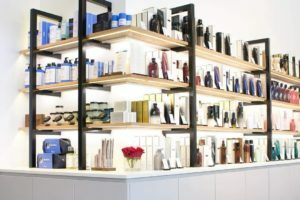 Committed to build leadership, technical and teaching skills, they attended Bumble and bumble University’s Network Educator Series at Bb.U in New York City. The three-day course included sessions on product ingredients, leadership, presentation skills and hands-on styling. Educators demonstrated techniques that Bumble and bumble’s Global Artistic Director Laurent Philippon used to style runway models for Lacoste at New York Fashion Week. Katie and Libby loved these techniques, as they applied them in a hands-on session with live models. Alley and Dempsey attended the renowned Bb.U Curl Class at Bumble and bumble University in New York City. 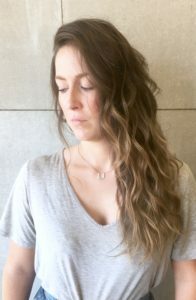 Curly hair comes in a variety of shapes and sizes, from spiral corkscrews to loose waves, and many curly-hair clients spend a lifetime looking for a stylist who can cut and style their hair in such a way that compliments their curls. 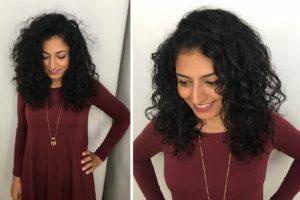 This hands-on styling and cutting course addressed the needs of every curl type. 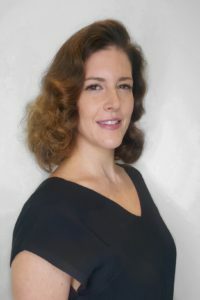 The stylists identified various curl patterns and applied Bb.U design techniques to create dynamic looks that complimented the client’s natural curls. Kelly Peach is a hairdresser’s hairdresser and an incredibly talented editorial stylist whose work has appeared in New York and Paris Fashion Weeks. She’s a popular social media beauty maven and insta-celebrity (@kellypeachbeauty), whose 16.1k Instagram followers give her a platform to share her vast knowledge of all things beauty – including self-styling tips! 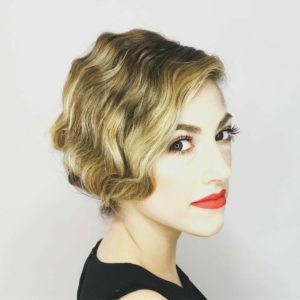 Kelly Peach’s editorial styling class covered versatile skills that can be used for a variety of formal hairstyles – classic finger waves and a low rolled bun. Her modern iteration of finger waves is an ode to “Old Hollywood” and is a style that has been seen on the red carpet among Amy Adams, Blake Lively and Miranda Lambert. The low rolled bun has become a go-to formal look – donned by Jennifer Lawrence, Emma Watson and Emma Stone. Kelly Peach innovated these classic looks by combining them into one powerful modern editorial style. To see more pictures from Kelly Peach’s class, click here.